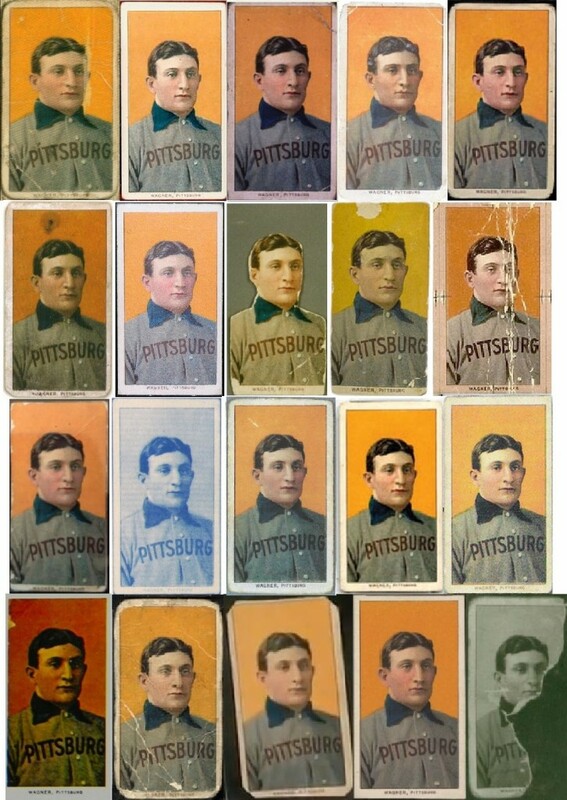 An HOS investigation into the population of T206 Honus Wagner cards reveals that there are at least 64 examples known to exist. Illustrated above are twenty of the earliest documented examples. (Correction: The first Wagners in the 3rd and 4th rows are the same card). But now that Bill Mastro has fessed up to trimming it with a paper slicer in the 1980s that same card is now a PSA- certified fraud sitting in the collection of Arizona Diamondbacks owner Ken Kendrick who acquired it in a private sale in 2007 for close to $3 million. PSA supporters and customers still believe Kendrick’s card will retain its value because of its infamous history but others claim the card is forever tainted since its been exposed as a monumental hobby fraud. 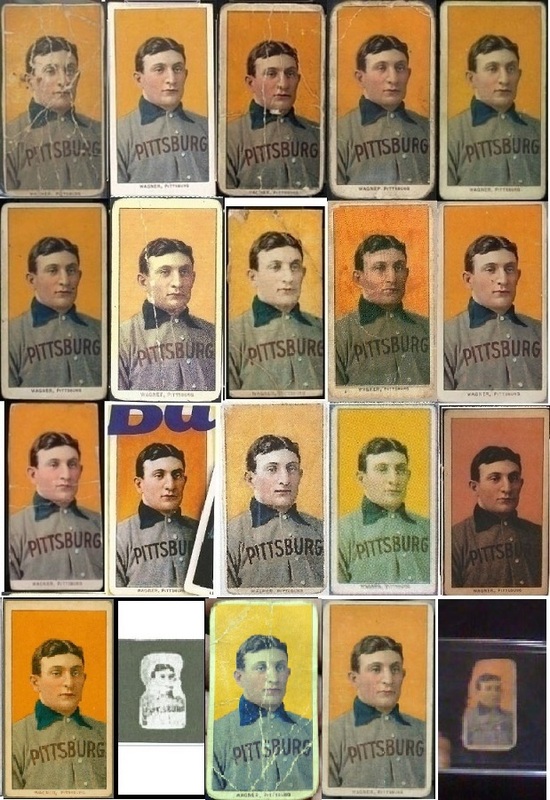 So, which Honus Wagner card will replace the trimmed Mastro example as the king of the hill? And how many Wagner cards actually exist? Hauls of Shame has been keeping track of Wagner cards for a few decades and just recently concluded an investigation into the actual population of Wagner cards known to exist. 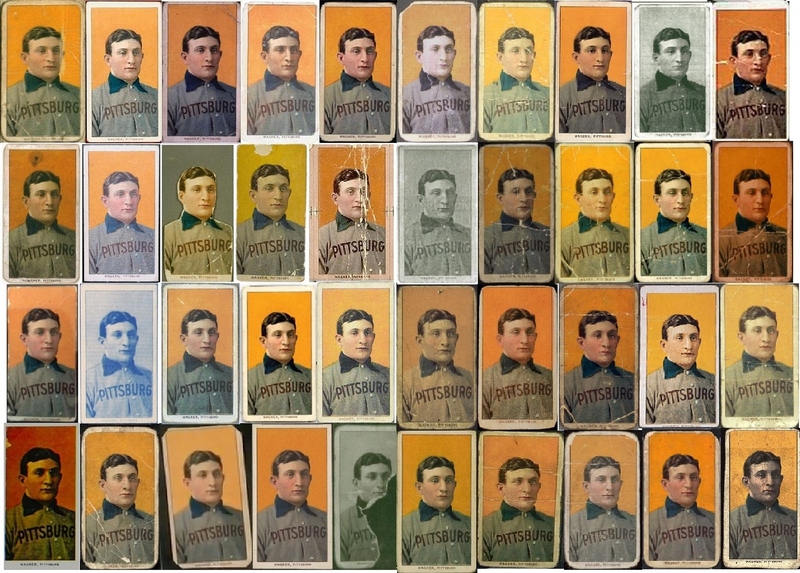 ESPN recently published incorrect and erroneous population totals stating that there are “about three dozen” Wagner cards known in private hands and institutional collections. What the Hauls of Shame investigation has uncovered is 61 actual images of existing Wagners and the confirmation of at least three other examples not yet supported by visual evidence. That puts the total at 64 (at a minimum). Further evidence suggests that there are possibly another ten unverified Wagner cards in private hands. A conservative combined value of the Wagners illustrated in this article exceeds $25 million–all for 60 pieces of cardboard. Some Wagners are housed in museum collections while others are stashed away in the holdings of former major league ballplayers, millionaires, sportscasters, auctioneers, Hollywood stars and even the descendants of the original owners who acquired them right out of cigarette packs in 1910. The existing cards have passed through a multitude of hands and each of them has its own unique story of provenance . In the next 12 months Hauls of Shame will publish a series of articles chronicling the travels of the existing Honus Wagner cards and also profiling the collectors who have owned them. The HOS investigation documented 64 known examples of the T206 Wagner card. This image includes number 1 through 40 representing the first forty documented Wagner cards in the hobby. The Wagner cards we have documented begin with the first examples that appeared in the press in the 1930s and 1940s and were identified as the toughest T206 cards to acquire. 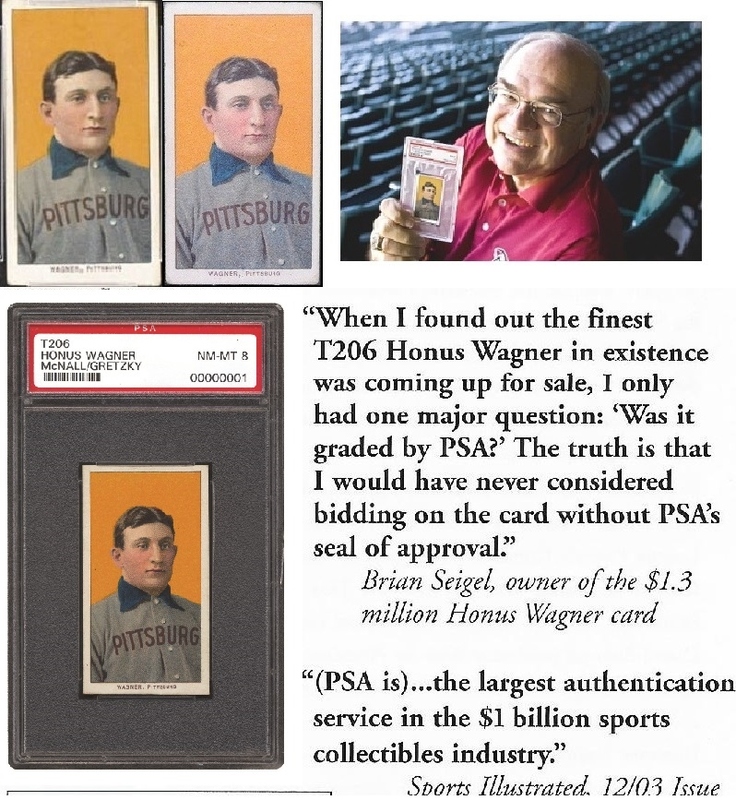 Of course, that story includes the Wagner that legendary card-collecting pioneer Jefferson Burdick acquired from Sgt. John Wagner when he donated his trove to the Metropolitan Museum of Art in 1947. It also includes the Wagner donated to the New York Public Library in 1946 by Leopold Morse Goulston in memory of his good friend Leo J. Bondy, a former vice-president of the New York Giants. Then there are all of the Wagner cards that have assumed their own identities over the years distinguishing themselves from other specimens with their lofty titles and gimmicky nicknames : The Die-Cut Wagner; The Wallet-Wagner; The Charlie Sheen-All-Star Cafe Wagner; The Sisters of Notre Dame (Nuns) Wagner; The Half-Wagner; The Jumbo Wagner; The Long Island Wagner; The Beckett Wagner; The Orem-Nagy Wagner; The Cooperstown Wagner; The Hoboken Wagner, Sgt. Wagner’s Wagner etc. The existing Wagner examples numbering from 41 to 60 appear above in a wide range of conditions ranging from trimmed examples to the high grade "Jumbo Wagner" in the top row. Bill Haber- The Assistant Sports Director for Topps Chewing Gum, Haber acquired his first Wagner on June 1, 1970 from legendary collector Wirt Gammon. Recalling the acquisition in his “Haber Hi-Lites” column in The Ballcard Collector Haber recalled, “I made a cash offer to all I knew had the card. Wirt Gammon accepted my offer and I bought his.” The price was $500. Existing Wagner cards have passed through the hands of several notable hobby figures including (clockwise): Bill Mastro; Rob Lifson; The New York Public Library; Brian Seigel; Bill Haber and Jefferson Burdick. The high grade "Jumbo" and "Hall of Fame" Wagner cards (top, left to right) would likely end up in the same condition (or better) than the trimmed Mastro-PSA Wagner (bottom left) owned by Ken Kendrick (top right). PSA used Brian Seigel's endorsement in their print ads in 2001 (bottom right). If the observations of Luckey and Ivy have merit, could collectors endorse similar trimming of Wagners with other “over-sized” high-grade examples known to exist? If the collector who recently purchased the “Jumbo Wagner” for $2.1 million at Goldin Auctions decided to trim his card it would equal or exceed the condition of the Mastro-PSA Wagner owned by Kendrick as would the Hall of Fame’s copy purchased from Barry Halper in the 1998 MLB purchase on behalf of the Hall. 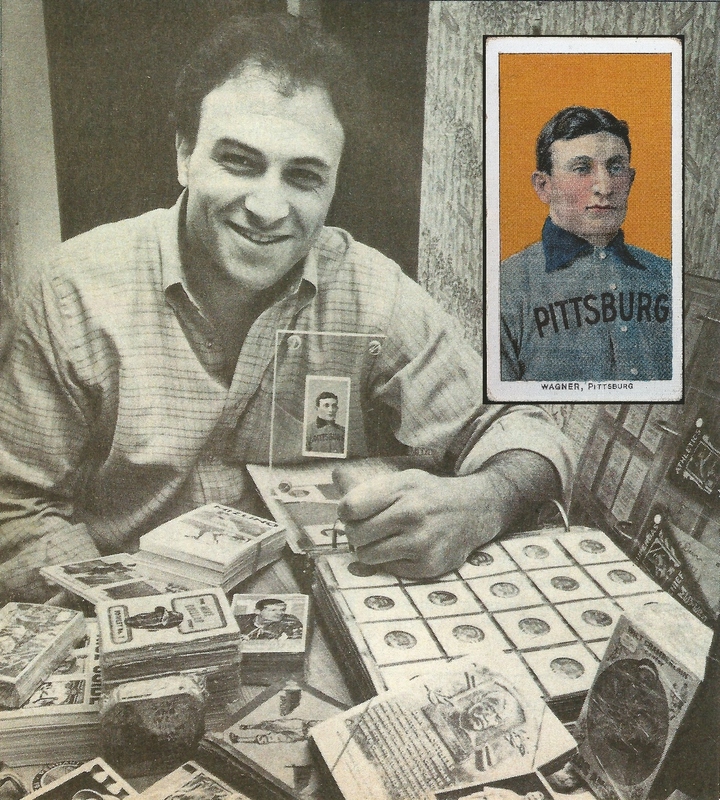 When Lew Lipset sold that copy to Mastro in 1981 he indicated that the card could be trimmed to attain mint condition status. Bill Mastro shows off his $25,000 over-sized and untrimmed Wagner card that he bought in a 1981 Lew Lipset auction. The card (inset) ended up in Cooperstown. Hauls of Shame asked several hobby insiders for their opinion of the trimmed PSA-8 Mastro- Wagner and also asked which Wagner they now consider the “Holy Grail”? Mike Mango (card dealer)- “If you trim a card in today’s market to make it a better grade and you make it undersized the grading card companies will reject it and it is deemed trimmed but if you take a card that was over sized and trim it to the specifications that the manufacturer had originally intended to correct his first time error why is it such a big deal if you bring it to the correct specs? Did you check t206resource.com? They have a good wagner gallery with over 40 wagners mostly graded cards. Do you account for alk of those in your total of 64? Yes, they have an excellent gallery of Wagners and they had one example we didn’t know of, a raw Wagner #43 in the gallery. They also had a color image of one Wagner that we only had a black & white photo of #37. I think this comment above says all you need to know about this issue: “I would venture to say that 95% of the PSA8-10 T206 cards are trimmed anyways”. Bill Mastro purchased and sold a Wagner in high school that he purchased from a priest who found it in his attic? Sounds like the typical seller bs of those trying to peddle fake Wagners on ebay… or something Barry Halper would say. Didn’t Mastro have a priests name he was using as a shill bidder? You can’t make this stuff up. The card, one of only 50 in existence, features Pittsburgh Pirate shortstop Wagner, nicknamed the “Flying Dutchman” for his immense speed and German heritage. It’s known as the “Holy Grail” of baseball cards because so few were created. Wagner made the sponsor — the American Tobacco Company — recall it when he realized it had been made without his permission. He didn’t want kids to buy cigarettes.